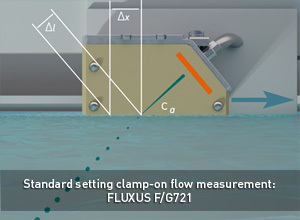 Highly sophisticated signal filters, faster than ever processing capacities and substantially improved measurement algorithms make the FLUXUS G721 flow meter a state-of-the-art measuring solution even for the most challenging applications. structure-borne noise, allowing for even more precise and reliable measurements. Extreme fast measurement cycles allow for precise real time monitoring of highly dynamic processes. The FLUXUS G721 offers non-intrusive flow measurement of virtually any kind of gaseous media, independent of the pipe size, material and with no upper pressurisation limit. Due to its advanced technology, the measurement is unaffected by gas wetness and distinguishes itself by its unrivalled turndown ratio: Even low flows down to only a few cubic meters per hour can be recorded accurately. As the flowmeter of choice for a very wide range of applications in virtually any industrial sector, the FLUXUS G721 is available with two different enclosure types: aluminium housing for standard applications and stainless steel housing for operation in highly corrosive environments. The stainless steel product variant is certified for usage in hazardous areas (ATEX, IECEX Zone 2, FM Class I, Div. 2).